The outcomes and results have been really positive feedback. Because it is an e-book format, it is available to download anywhere in the word and we have received some really great outcomes and results from this initiative. We screen it for content, our team at Fitzgerald & Partners screen it and we get as much feedback on it before we actually finalise the project and initiative. We are now in the process of starting 2019/2020 publication and this will have a theme of sports and the arts. 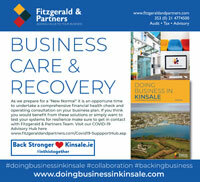 Our first “Doing Business In Kinsale 2017" had a key theme of education running through it. Our second one had a key theme of entrepreneurship combined with education running through it, as education is an important factor for leading CEO’s and executives to base their family here, to have good education locally is one of their deciding factors in moving to an area. It has been a very exciting project. We also have hardcopies of it which we will bring to various events, meetings with Government, etc That was one area that we focused on as a niche that centred and anchored ourselves in the heart of the community. If you would like to be part of our 2019/20 publication please email us and you can see our current version on www.doingbusinessinkinsale.com as a guideline. It is open to all local stakeholders who have an interest in the town or local groups, organisations, charities and business.
" A rising tide lifts all boats "